Here are some interesting facts about Albania. Albania is one of the smallest countries in Europe, with an area of about 28,000 square km. It borders the Adriatic Sea and the countries of Montenegro, Kosovo, Macedonia and Greece. During the 15th century, much of Albania was under the rule of the Ottoman Empire. The country declared independence in 1912 and became a Communist country after World War II. 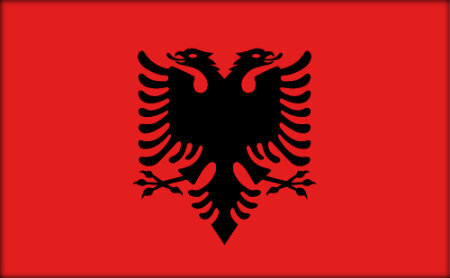 The Republic of Albania was established in 1991 after the Soviet Union broke up. Today the country is a member of NATO, the United Nations, the Energy Community and the World Trade Organization. It has a population of about 3 million people, with most living in the capital and largest city, Tirana. Much of the country is mountainous, with Mt Korab at 2,764 metres, the highest. In 2011, Lonely Planet Guidebooks named Albania as number one on the top ten countries to visit. One popular destination is the coastline, which stretches for almost 500 km. Albania was known as Illyria in ancient times. The inhabitants call their country Shqiperia, which means Land of the Eagles, and the Albanian flag has a two headed eagle on it. Albanians shake their head to mean yes, and nod to mean no. Albanian is the country’s official language although Greek is also widely spoken. By the 2nd century Albania was a Christian country. The Ottomans introduced Islam into the country during the 15th century although today Albania is one of the world’s least religious countries. Berat is known as the Town of a Thousand and One Windows. This World Heritage Site is famous for its decorative windows, castle and 13th century church with colourful murals. Albania’s only international airport is in the capital, Tirana. In 2001 the airport was named Mother Teresa Airport, in honour of the nun whose family lived in the country at one time.